With the recent launch of the new iPhone 6 ‘phablet’ and watch it’s clear that a large portion of our population are crazy about gadgets! Car manufacturers know this and are all racing to release new model cars with the most innovative and high tech gadgets. So due to consumers want more high tech features experts are predicting a big year of enhancements to existing technology and more new systems in 2015. All resulting in driving that’s easier, safer and perhaps more entertaining! One of the brightest things on the horizon are laser headlights. These are smaller, more powerful and more efficient than the LED headlights that were only introduced in recent years. Already fitted to Audi and BMW in Europe they have yet to be approved in the US and Australia. And while you think it may be because they’re too bright, the lamps are fitted with a diffuser system that allow them to keep their bright, white illuminating power while making them safe to view. BMW laser headlights still awaiting approval in Australia. Next on our list of effective enhancements is the lane change assist. This isn’t as you might think the alert that sounds when you drift out of lane, this system identifies when traffic is approaching from behind at speed and warns the driver when the signal is given to change lanes. The Subaru Outback – a very popular in Tasmania – in 2015 will be able to determine when it’s safe to change lanes and advise against a manoevre if it detects another car rapidly approaching. Sensors and cameras monitor approaching traffic in the adjacent lanes – flash an alert on the mirror to advise against the lane change. Could be useful in the rush hour on the Tasman Bridge! 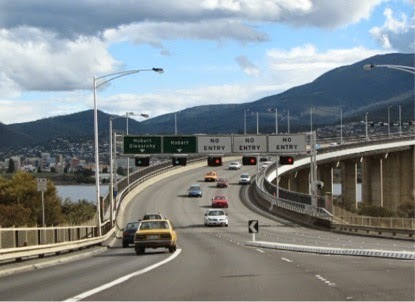 Lane change may assist on the Tasman Bridge. Technology will also help drivers in bigger more crowded cities to find parking spaces and then locate a car (if you can’t remember where you parked). And once arriving at a parking space, those sensors and cameras again will enable a car to steer itself into a parallel or perpendicular space while the driver operates just transmission and foot pedals. On an entertainment level, more and more luxury vehicles such as Audi, BMW and Mercedes- Benz will provide in car internet access. But topping that is GM Motors in the US who are fitting most new model cars with a system that provides 3 months of service and / or three gigabytes of data free! New smartphone integration platforms through Apple CarPlay and Android Auto will transform the infotainment system into a version of the smartphone’s operating system. Making a system more intuitive and allowing voice recognition to play music, use maps and ‘voice texting’ - which used to be known as making a phone call!! Now just the note to self, if purchasing one of these high tech vehicles, that cars are to get you from A to B safely. So leave the playing with the entertainment gadgets to the passengers on board! !